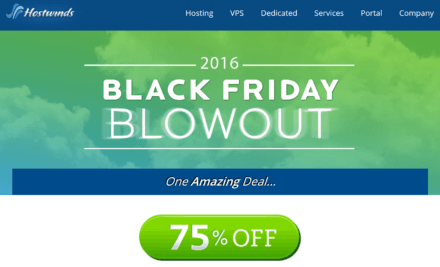 A quick look at a couple of blog hosting providers and you will notice that their prices usually come with a footnote saying that the discounted rates are applicable only for the first term of your subscription. This means come renewal time, you will be facing a higher monthly bill for the same level of service. HostWinds breaks away from this practice by offering their regular rates front and center. Not only that - their rates are highly comparable to the discounted prices of competitors, making HostWinds a cheap solution for hosting your blog. That said, they aren't perfect, as you will see in the complete review below. Softaculous Included: You can easily add your favorite tools and apps to your blog, make the building process a whole lot easier, and give your website an interface that stands out from the rest. No Hidden Renewal Rates: All prices on the HostWinds website are their standard rates, without any hidden terms or footnotes. Back-ups For Data Protection: HostWinds performs nightly back-ups of your account to ensure that everything is safe and sound even during a malfunction. Single server location: Unfortunately, HostWinds only houses their datacenters in Dallas, Texas, and while this is great for US-based visitors, it may not be ideal if your blog is gaining recognition in the international scene. No CDN service: HostWinds doesn't yet offer a CDN service to help you deliver content more efficiently regardless of your visitors' locations. HostWinds offer a variety of hosting options: Shared, Business, VPS, and dedicated servers all line up under their roof. If you are only starting on your blogging venture and carry a small budget, then their shared hosting packages are a perfect fit. Their shared hosting plans contain the same features, so you get to enjoy unlimited storage and bandwidth across the board. the only real difference between each are the number of domains allowed. All plans include Softaculous for one-click installation of a whole boatload of apps into your account. With over 400 apps to choose from, from blog tools and galleries to social networking software and visitor polls, you’ll never run out of choices. The packages also include instant account setup, web CEO account, unlimited sub domains, emails, MySQL databases, and FTP accounts, the latest cPanel version, hotlink protection, file manager, password protected directories, Awstats, and a log manager complete with error monitoring. They also offer other services like SSL certificates, domains, Windshield (firewall protection), Windspeed (optimization), VPN, and ShoutCast, a broadcasting tool for your own online station radio. You can visit their website for more information about these services and more. If you plan on signing up for a longer duration, you will be able to enjoy discounted monthly prices, which can go as low as $4.50, $5.50, and $6.50 for each plan. Do bear in mind though, HostWinds does not offer any money-back guarantee, so it is best to subscribe to a shorter duration first to test everything out before committing to them for the long term. Meanwhile, all prices published by HostWinds are their regular prices, unlike other hosting providers that give an introductory price and keep their original rates tucked away in easy-to-miss footnotes. In other words, you can expect the same amount in your monthly bill even when you renew your contract. As previously mentioned, HostWinds’ datacenter is located in Dallas, Texas. If you have any doubts about their speed and performance, you can use their speed console on their website to initiate a speed test. You can opt to download the file, or start a ping test using their IP address. Plus, their servers are connected to industry standard generators that supply sufficient electricity to the system in case of a power failure, further ensuring their 99.9% uptime guarantee. HostWinds has a content-filled knowledgebase section where you can find articles on web hosting, networking, pre-sales concerns, general discussions, and others. You can use their search toolbar to easily get related results to your query. To get in touch with their customer support, you can initiate a live chat session, call their hotline, send an email, or submit a ticket request. Their office is open 24/7 to assist you with all of your concerns and inquiries. You can also connect with them via Facebook, Twitter, and Google+. HostWinds is one of the cheaper alternatives when it comes to blog hosting, and not just for your first period of subscription, but for as long as you are under their service. You also get to enjoy unlimited features, such as storage and bandwidth, whichever plan you choose. They only have one datacenter located in Texas though, and there are no news if they plan to establish servers in other locations to help with content delivery, especially since they do not include a CDN account in their service, unlike most hosting providers. Still, they are a good hosting company for your blog if you do not plan on increasing your hosting budget even after many months of using the service.